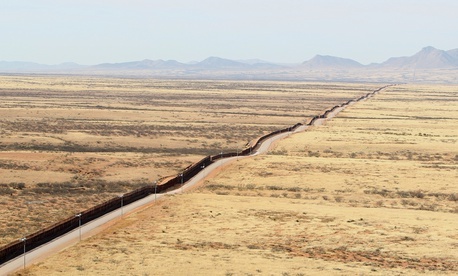 “It’s a 2,000 mile border, but you don’t need 2,000 miles of wall because you have a lot of natural barriers. You have mountains. You have some rivers that are violent and vicious. You have some areas that are so far away that you don’t really have people crossing. So you don’t need that. But you’ll need anywhere from 700 to 900 miles,” he told reporters on Thursday. In fact, that’s a good description of what’s already along the southern border. Some 650 miles of the border has already been blocked off with pedestrian or vehicle fencing as a result of President George W. Bush’s 2006 Secure Fence Act, which authorized the construction of a 700-mile wall of double layer fencing.“You know, we've already started the wall because we're fixing large portions of wall right now,” Trump said. He explained that the repairs were “making it new,” and thus “in a true sense, we've already started the wall.” His remarks suggest that his promise to “build the wall” could involve erecting as little as 50 miles of new barriers. If the Trump administration no longer intends to significantly extend the existing barriers, the biggest change may be the form they take. Congress recently allocated a little more than $341 million “to replace approximately 40 miles of existing primary pedestrian and vehicle border fencing along the southwest border using previously deployed and operationally effective designs, such as currently deployed steel bollard designs, that prioritize agent safety; and to add gates to existing barriers” in its spending bill. Erecting a physical barrier along the entire length of the southern border was a daunting task from the beginning: The topography can be an obstacle and obtaining land from private property owners can also present a challenge. Trump’s remarks appear to recognize these hurdles, as well as provide some detail on what he envisions—and why. Trump also told reporters Thursday that one of the requirements in erecting a border wall is the ability to “see through it.” The idea might sound far-fetched, but in fact, Department of Homeland Security Secretary John Kelly has also made similar remarks in the past. “One of the things with the wall is you need transparency. You have to be able to see through it. In other words, if you can’t see through that wall—so it could be a steel wall with openings, but you have to have openings because you have to see what’s on the other side of the wall,” Trump said. In February, Kelly testified before the House Homeland Security Committee that people on the border told him “their preference [for a physical barrier] would not be something they couldn’t see through.” Customs and Border Protection released guidelines for contractors in March. Among the options provided to them was “a see-through component/capability.” Ronald Vitiello, acting deputy commissioner at CBP, told reporters in June that the agency had not signed any contracts as of yet.